Element Energy has been awarded funding for Phase 2 of the Department for Business, Energy and Industrial Strategy’s Non-Domestic Smart Energy Management Innovation Competition. This follows on from a successful Phase 1 project in which we developed the Energy Comparison & Advice Tool (E-CAT), a smart energy management software tool for non-domestic customers (see the Phase 1 press release here). Phase 2 is running between now and January 2019. We are partnering with Octopus Energy to trial E-CAT with a small number of customers (around 20). Trial activities will include developing data monitoring and processing approaches and conducting user testing and using the feedback to update and improve E-CAT. 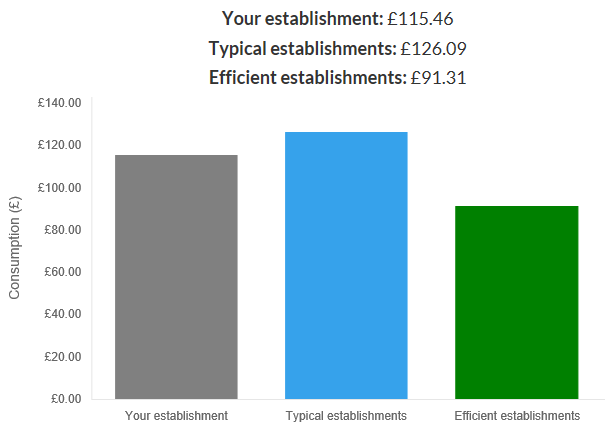 E-CAT is an easy-to-use online tool which uses customers’ smart meter data to provide real-time (half-hourly resolution) comparative feedback on their electricity usage (i.e. comparing customers’ usage to organisations of the same sector, size, etc.) and tailored, actionable energy efficiency advice. It also includes a range of other features such as comparison within chains, historic comparison, identifying background power levels, tariff switching (same supplier) and DSR engagement, with more features in the pipeline. It has been developed for small non-domestic customers in the retail, hospitality and schools sectors, and it requires only a smart meter data feed to provide significant benefits. See below for example E-CAT screenshots. If you are interested in getting involved in future large-scale trials of E-CAT, or for more information about this project, please contact Mark Hughes or Jonathan Stokeld. Element Energy, along with partners Jacobs and Cardiff University, have been commissioned by BEIS to complete analysis on the potential use of full hydrogen for heat in industry, as part of the Hy4Heat Programme. 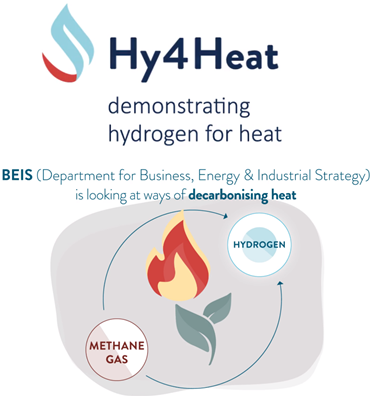 Hy4Heat is a feasibility study, commissioned by the Department for Business, Energy & Industrial Strategy to establish if it is technically possible and safe to replace natural gas with full hydrogen in buildings and gas appliances, in order to decarbonise the heat sector. The aim of this study, Work Package 6: Understanding Industrial Appliances, is to investigate the potential future conversion of industrial heating appliances to hydrogen. Our study will involve developing a comprehensive understanding of applications of hydrogen for heat in industry, including costs, technical and commercial requirements, timeframes, safety considerations, barriers and opportunities. It will also be critical to build a strong, clear picture of current and future natural gas heating processes and appliances across the industrial subsectors. Modelling work will provide an evidence base for the Hy4Heat Programme and inform future government decisions regarding potential energy pathways. The study will also document remaining knowledge gaps and outline the kind of hydrogen trials and appliance development work required, ahead of any potential decisions around conversion to hydrogen. The findings will be applicable to a broad audience, including industry, policy makers, project developers, equipment suppliers and other government officials. For more information on Element Energy’s study please contact Emrah Durusut. Meeting the targets committed to in the Paris Agreement will require deep decarbonisation of all sectors of energy use to limit the increase in global average temperature to well below two degrees above pre-industrial levels. Cities such as London have a pivotal role to play in achieving these objectives and must develop robust climate action plans. Element Energy was commissioned by C40 Cities Climate Leadership Group and the Greater London Authority (GLA) to undertake an analysis of decarbonisation scenarios to inform London’s strategy on energy and climate. The study employs detailed modelling of London’s buildings, vehicles and energy supply to provide insight into the technology options available for low-carbon heating and transport. 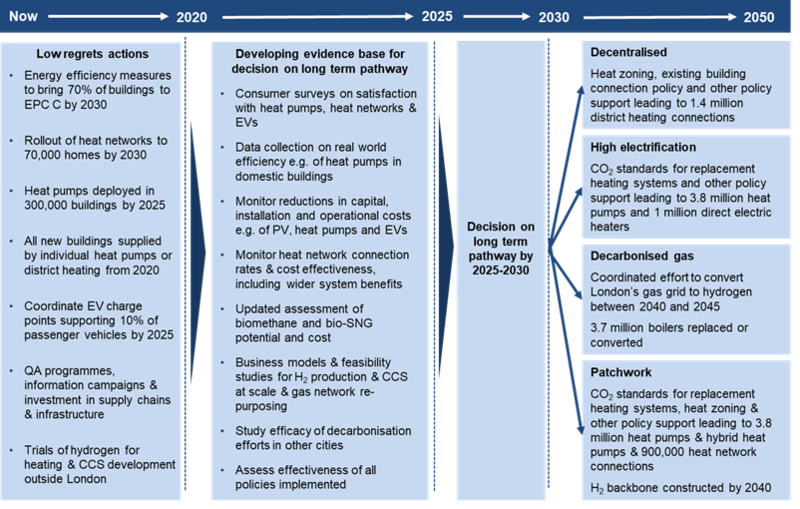 It aims to give a clear analysis of the infrastructure required to support the four potential scenarios (summarised in Figures 1-3 below) to reduce London’s emissions, including the electricity and gas grid, heat networks, electric vehicle recharging and building-level infrastructure. The analysis includes the carbon and cost implications for each scenario, as well as highlighting the challenges and uncertainties associated with them. The results have informed London’s five-year carbon budgets and will support energy policy decisions, highlighting key decision milestones. There are several policy actions that could be taken immediately, either locally or nationally, to support technologies at the minimum levels present in all scenarios and to enable a decision on the preferred scenario in the late 2020s. These low regrets actions entail significant activity from 2020, meaning that decisions by local and national government on the form of the supporting policy need to be made in 2018-19. Beyond the low regrets actions, planning needs to start now in order to ensure that decisions on the longer term decarbonisation scenario can be made by the mid-2020s, when the various scenarios considered diverge more clearly. 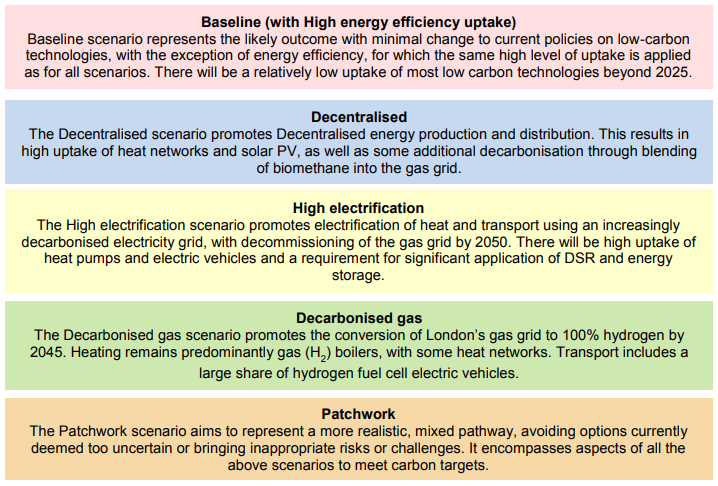 Each scenario focuses the greatest policy effort in a single area (district heating, heat pumps, or full hydrogen grid conversion) to reflect approximately equivalent levels of policy ambition. Figure 4 below presents a timeline of the actions and decisions proposed. For more information on this study and our work on decarbonisation pathways, please contact Sam Foster. As the European Union and member states discuss reducing CO2 emissions from cars and vans, today’s Hydrogen Mobility Roundtable highlighted that local authorities, large industrial companies, and global vehicle OEMs are prepared to deploy zero emission mobility as an economically attractive solution requiring no compromise to operational requirements. Hosted by Hydrogen Mobility Europe (H2ME) in partnership with the European Commission’s Fuel Cells and Hydrogen Joint Undertaking (FCH JU) and Hydrogen Europe, the roundtable event comes the day after the European Parliament voted on setting tougher carbon dioxide emissions limits for cars and vans, in line with the policy aim of driving the adoption of low and zero emission vehicles. As part of the legislation, the EC will treat both hydrogen fuel cell electric vehicles (FCEVs) and battery electric vehicles (BEVs) as zero emission vehicles. The roundtable highlights that today’s technological advancements can support Europe to become an ambitious leader in zero emission mobility, underlining the inherent potential of hydrogen to deliver global emission reductions whilst meeting our future energy needs. The H2ME project is playing a critical role in creating the world’s largest network of hydrogen refuelling stations (HRS). 49 stations will be funded under the H2ME project, of which 15 are already in operation . At the event, representatives from the initiative met with local municipalities and regional government representatives from across Europe to discuss real-world experiences, best practice and proven business models for the increased roll-out of FCEV vehicles and cross-border hydrogen refuelling infrastructure. Under the H2ME project 360 vehicles have already been delivered to end users and have been driven for close to 2 million kilometres. Attractive ownership models are developing in use cases such as taxis, captive fleets, and in cities with strict environmental targets. Interest in FCEVs is increasing across Europe, with national governments in Norway, the Netherlands, the UK, France and Germany, amongst others, all supporting greater adoption. However, municipalities are waiting for greater direction from EU legislation to provide them with clear guidelines before rolling-out hydrogen fuelling stations and fuel cell fleets. See the full H2ME press release for further information. A consortium of ITM Power, Element Energy, INOVYN, Storengy and Cadent have been awarded Innovate UK funding for a feasibility study to deploy a 100MW Power-to-Gas (P2G) energy storage project, “Project Centurion” at Runcorn, Cheshire, UK. This world class project explores the electrolytic production, pipeline transmission, salt cavern storage and gas grid injection of green hydrogen at an industrial scale. The feasibility study will explore the system design and costs and will assess the business case for deployment. The vision for Project Centurion is to demonstrate a 100MW P2G energy storage system which can produce low carbon hydrogen for heat, decarbonisation of industry, and transport fuel. Once successfully demonstrated, such systems can make a significant contribution to the decarbonisation of the electricity and gas networks, and by coupling these two networks together provide energy storage, allowing the UK energy system to accommodate increasing amounts of renewable energy, reducing curtailment and constraints. As well as contributing to decarbonisation, P2G systems can improve security of energy supply and improve the UK balance of payments by producing indigenous fuel offsetting the need to import fuel. Once built, Project Centurion will be a world class innovation project: it will be the first-time a P2G system injects hydrogen into the public gas network in the UK at scale. See the full ITM Power press release for further information. Element Energy and project partners invite you to save the date for the Coventry Hydrogen Event that will take place on the 17th October 2018. The event is hosted by Coventry University. This event will celebrate the achievements of the FCH JU-funded SWARM Project, which finishes this year, putting them in the context of the wider hydrogen transport landscape in the UK and Europe and reflecting on the benefits of implementing the technology as a local solution. The Save the Date invitation can be found here or you can register here. Element Energy has been awarded funding as part of the Department for Business, Energy and Industrial Strategy’s Non-Domestic Smart Energy Management Innovation Competition, to develop a smart energy management software tool for non-domestic customers in the retail, hospitality, and schools sectors. Smart meters are being rolled out across small non-domestic customers in GB, but there is currently a lack of energy management products and services building on these smart meters to help small non-domestic customers to engage with and reduce their electricity consumption. To help address this market gap, Element Energy will develop an online (and mobile friendly) tool providing energy management services including real-time comparative feedback on consumption (i.e. relative to similar organisations in the same sector and of a similar size), provision of a range of customer-specific energy saving analysis and advice, and a direct demand-side response (DSR) engagement facility. This tool will build on an existing online tool that Element Energy has developed providing comparative consumption feedback, customised energy saving advice and DSR facilitation in the domestic context. The outputs of this project will include an operational prototype online tool providing real-time comparative consumption feedback, energy saving analysis and advice and DSR functionality to non-domestic customers in the retail, hospitality and schools sectors. This innovative project will be the first time that these comparative feedback and DSR aspects have been provided to small non-domestic customers in real time. The full competition announcement by BEIS can be found here. For more information about this project, please contact Mark Hughes. Element Energy led a study with partners E4tech for the National Infrastructure Commission (NIC) to examine the costs associated with different pathways to decarbonising heat in the UK. These pathways included electrification (heat pumps, electric storage heating), decarbonisation of gas (hydrogen networks, biomethane) and hybrid gas-electric approaches, supported by the deployment of energy efficiency, heat networks and biomass combustion. The cost analysis considers all levels of the energy system, including the building level consumer costs, the cost to the electricity and gas distribution and transmission networks, the cost of CO2 transport and offshore storage and the generation and raw resource costs. This study provides a clear and transparent comparison of the likely costs of decarbonising UK heat using different pathways, whilst highlighting the impact of uncertainties and practical barriers to implementation. The work demonstrates that while the cost of heating is likely to rise in the UK, the costs are manageable and heating is expected to represent a smaller share of GDP in 2050 than today. However, the study indicates that any decarbonisation pathway will require a much-increased level of ambition relative to current policy. While there are low regrets options in the short term, including cost-effective energy efficiency measures and deployment of heat networks in certain areas, the various pathways for heat decarbonisation in the UK diverge clearly from the mid-2020s and important decisions on the future of the UK’s energy and heat infrastructure will need to be taken in advance of that date. The findings suggest that significant uncertainties remain regarding the cost of the different long-term pathways, and that there is no clear winner at this stage. However, under stated assumptions regarding the development of the required component technologies, it is found that decarbonisation of the gas grid with hydrogen has the potential to be the lowest cost option and should be taken seriously as an alternative to deep electrification. The project report is available on the NIC website: https://www.nic.org.uk/publications/cost-analysis-of-future-heat-infrastructure/. The work informed the NIC’s National Infrastructure Assessment published in July 2018. For more information on this study and our work in sustainable heat networks, please contact Sam Foster. A new report released today shows that improving the dialogue and collaboration between public and private stakeholders would be crucial in supporting the deployment of Carbon, Capture & Storage (CCS), a key technology for many deep decarbonisation trajectories. The report was prepared by Element Energy and Vivid Economics on request by the Oil and Gas Climate Initiative (OGCI). A common finding across technical and modelling studies such as IPCC AR5 and the IEA CCS scenarios is that CCS is vital to reducing emissions at lowest cost. However, both public and private sector stakeholders are hesitant to commit the resources necessary to scale-up and roll-out deployment of the technology. The report suggests that CCS technology is technically available but all market participants must become familiar with the technology and the contractual arrangements supporting its deployment. The scale-up phase proposed in the report comprises a limited number of full-scale projects, focussed on improving cost certainty and proving deliverability globally in key application sectors. Obligation with CCS certificates: Emitters or fuel suppliers are obligated by law to ensure a certain amount of CO2 is captured and stored. Certificates are awarded for storage and can be used to meet the obligation and traded freely. Emission performance standards (EPS) with CCS certificates: An EPS sets minimum emission standards by which emitters must abide. The tradeable certificates function similarly to the obligation scheme and can be used to meet the standard. Public procurement, including contract for difference (CFD), entails the government directly procuring CCS. It does not imply the government necessarily funds CCS. Tax credits are reductions in the tax liability of firms if they perform CCS. Credits can be provided for stored carbon but also for capital investment. Other options, such as carbon price (with the exception of Norway) have been insufficient to deliver CCS commercially to date. Policy instruments should be tailored according to global regions where the specific political, legal and cultural contexts are considered. Secondly, a policy instrument should not be solely focussed on providing revenue for stored carbon but also needs to incentivise efficient investment in CO2 network infrastructure. Finally, all parties will have to contribute to the scale-up costs of CCS: governments in terms of tax breaks or investment, the private sector via investment measures or certificates and end users via levies (e.g. fuel consumers). For more information on this project and our work in CCS, please contact Emrah Durusut. The commercialisation of the hydrogen fuel cell electric vehicle (FCEV) edges closer to reality with the launch of the €26 million pan-European ZEFER (Zero Emission Fleet vehicles for European Roll-out) project. Co-ordinated by Element Energy, this ground-breaking initiative will deploy 180 hydrogen fueled vehicles into a combination of taxi, private hire and police fleets across Paris, Brussels and London. With the cars being used every day over long distances these vehicles, and their supporting infrastructure, will be pushed to their limits to highlight the technological merit of hydrogen transport and the promising business case for future fleet FCEV adoption. ZEFER will provide a key catalyst to the real market adoption of hydrogen cars across European cities. By deploying captive fleets of FCEVs, a steady demand for hydrogen fuel can be created and the economics of operating a hydrogen refueling station improved. This could prove to be a key transition point for hydrogen fuel cell cars as the daily costs of running a vehicle becomes more accessible to the wider commercial market. Additionally, with stricter air quality regulations being introduced by many cities and municipalities, the ZEFER project will highlight the viability of FCEVs to provide a zero emission alternative for diesel vehicles in inner city areas. Additional detail is provided in the project press release and on the project website (zefer.eu). For further information please contact lisa.ruf@element-energy.co.uk.